Wellcam Machinery Corp., established in 1989, and was starting her business in making varied industrial machines, special purpose machines and sell to the countries in Southeast Asia. The parts used on the machines we developed are as high as 80% to be in-house production. 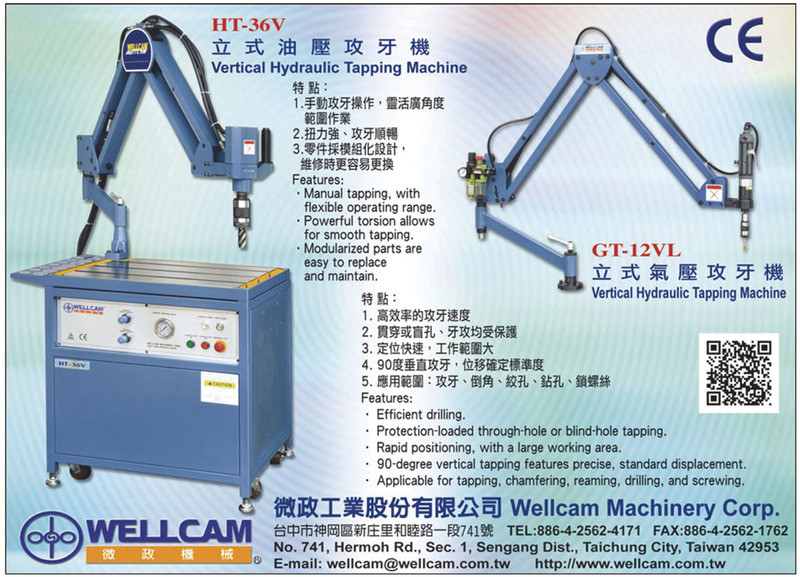 In 1998, we were concentrating in the R&D, manufacture, distribution of tapping machines under the brand name "Wellcam". At the same time we use the tapping machine we made in our other production line as trial and the reference for the machine modification. The machines have obtained good reputation by all our customers overseas who is selling Wellcam Tapping Machines comes from Russia, France, Belgium, Ukraine, Italy, Turkey, India, Indonesia, Malaysia, Korea, China and domestic market. Based on the ever-lasting policy, keep improving in product quality, technique and service, so as to meet customer's satisfaction has been always our commitment. WELLCAM Tapping Machine is good for many kinds of industry. Such as in support of CNC machine center by processing the tapping works left by CNC. Or in support of CNC laser machine to finish the tapping work. The application of the tapping machine is covering wide range of industry. For example, sheet metal, control panel, valves, pneumatic valves, hydraulic valves, dies, metal parts. Believing our tapping machine can significantly decrease the production cost, increase the production efficiency. It plays a very important role in the field of machine processing nowadays and is an indispensable equipment in your factory.